Spider-Man first swung into our lives in 1962, created by comic book legends Stan Lee and Steve Ditko. Since his irradiated spider bite in Amazing Fantasy #15, Marvel has been spinning webs with Peter Parker for nearly 60 years—a heck of a lot of adventures for the wise-cracking, fourth-wall-breaking wall-crawler. Spidey's history is stuffed full of inside jokes, sight gags, and pop culture references dating back decades; here's a look at some of the more memorable details you might have missed along the way. After hundreds of issues and dozens of reboots, team-ups, multiverse-rendering events, and even an infamous deal with the devil, few aspects of Peter Parker's personality remain unexplored. Even so, Spidey's usually too busy bustin' heads to run down his Netflix playlist or allude to watching his favorite teams—well, aside from a namedrop or reference here and there as he chattily battles a dastardly desperado. Peter Parker: Spider-Man #33, written by Paul Jenkins with art from Mark Buckingham, gives us a rare sporty moment for Peter, who reminisces about a trip to the ballpark with his Uncle Ben as a child. 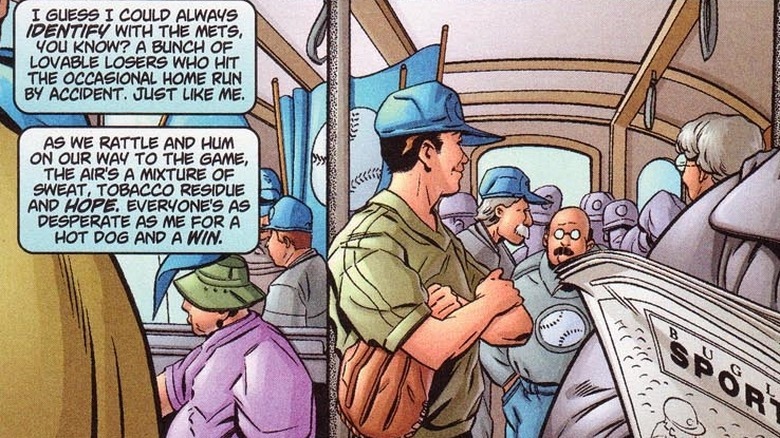 The Queens-born superhero has often been associated with the New York Mets, but he reveals the true reason he loves the squad during the flashback: they're "a bunch of loveable losers who hit the occasional home run by accident. Just like me." If that's not a ringing endorsement for your hometown heroes, we don't know what is. In the long run it makes sense, since Spidey is the ultimate underdog. Peter even got married to Mary Jane as a publicity stunt at Shea Stadium in 1987. And here we just assumed Marvel couldn't afford Yankee Stadium. Frank Miller and Alan Moore launched a new breed of more intense comics in the '80s, in which heroes like Batman and Daredevil received tough-guy makeovers and violent story lines like The Dark Knight Returns, The Watchmen, and one of the era's most controversial books: Alan Moore's Batman: The Killing Joke. The one-shot features the Joker kidnapping and crippling Barbara Gordon before torturing Commissioner Gordon himself. All of this to test the Dark Knight's mettle—and Joker's theory that one bad day is all that separates heroes and villains. You probably knew that, but did you know the Clown Prince of Crime made a sneak appearance in Spider-Man's friendly neighborhood? In Web of Spider-Man #50, writer Gerry Conway offered an homage to Moore's modern masterpiece. The issue finds Spidey accused of swiping jewels and fighting a veritable rogues' gallery, including Puma, Prowler, and Sandman. He clears his good name, but a minor tiff between Robbie Robertson and his wife at the courthouse is bombed by a familiar fellow in a purple suit. 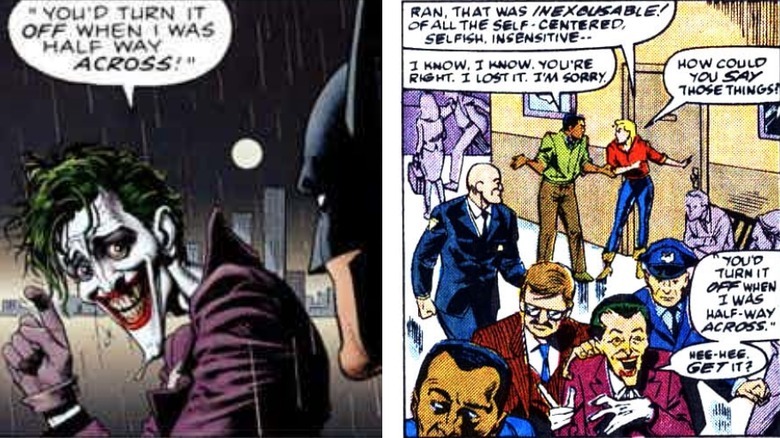 Under surprisingly low security, the Joker lookalike is escorted to or from an engagement, while repeating the punchline of the joke he tells at the end of The Killing Joke. In the original, Batman and Joker laugh themselves out of the panel, but the Spider-gag probably flew under most radars, especially his legal entourage. Bender from Futurama in Iron Man? Futurama was cross-pollinated with pop-cultural touchstones, often extrapolating our future from contemporary culture—such Nixon's return to popularity as a politician without a body—as well as making topical jokes about the environment, politics, and human foibles. Misanthropic robot Bender was one of the show's breakout characters, drawing a following through his crass humor, penchant for selfishness, and love of petty crime. 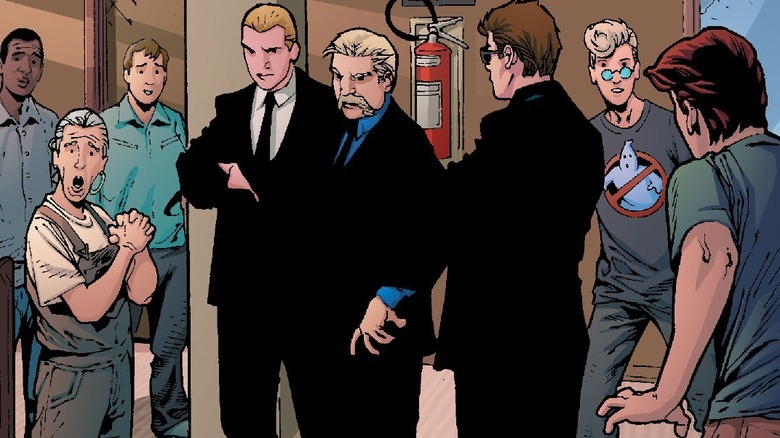 In Ultimate Spider-Man #153, he made a cameo in the Marvel universe when Peter Parker received a grand tour of Tony Stark's super-suit collection. 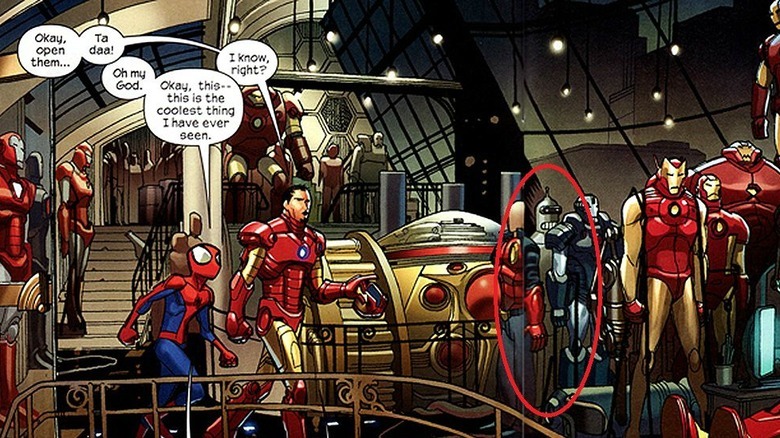 Iron Man fans got a quick look at decades' worth of the hero's couture, but astute readers also caught another suit of armor: if you break out your monocle, you'll see artist David LaFuente's reference to Bender's shiny metal visage in the background. Admittedly, the Bender Armor may actually be avreference to Iron Man's first suit. True Believers will note, however, that the original Iron Man helmet doesn't have a smirking oval mouth or an antenna. Throughout the years, Spider-Man has worn a lot of different hats—from average, arachnid-enhanced New York teen to spacefaring Avenger and corporate mogul. Yet through it all, Peter Parker will always be identified with his roots as an awkward misfit. Who among us can't identify with his fumbling journey through the social landmines of high school? Spidey's age and status often shift, depending upon the series and the creative talents involved. In 2000, Marvel booted up the Ultimate Universe, giving readers a chance to see a Peter the opportunity to act like more of jerk—maybe that's why Marvel killed him off and replaced him with Miles Morales 12 years later. In any case, writer Brian Michael Bendis and artist Mark Bagley were regular old Easter bunnies when it came to hiding eggs. In Ultimate Spider-Man #40, Peter deals with all the usual issues, including his on-again-off-again relationship with Mary Jane, avoiding Flash Thompson-based violence, saving people from thugs in alleyways, and, naturally, dealing with a villainous teenage mutant high schooler. Oh, and ignoring student council elections. 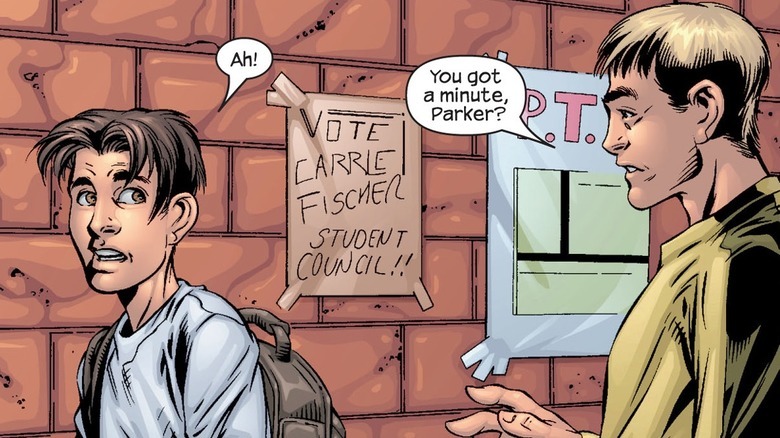 One panel includes a candidate Star Wars fans would line up around the block for, as a poster behind Peter asks students to vote for "Carrie Fischer," a fairly obvious nod to saga star Carrie Fisher. John Hughes' oft-quoted coming-of-age classic Ferris Bueller's Day Off is populated with a number of unforgettable characters—including the quintessentially dreary teacher played by Ben Stein. Brian Michael Bendis and Mark Bagley's Ultimate Spider-Man #1 introduced the world to an updated Peter Parker and, at the same time, brought the comic back to its teenaged roots in an edgier fashion. The duo also used the book to send up or shout out to their favorite characters and cultural curios. The very first issue includes at least one Simpsons reference, as the featured bus driver is an "Arrowsmith" hat-wearing longhair with a very similar comportment to Otto Mann. To top that off, Peter's economics class includes a very familiar face: assuming that "anyone? anyone?" isn't a dead giveaway to Bueller boosters, the addition of Stein's famous hint, "something d-o-o economics…voodoo economics" seals the deal. Apparently, Stein's "Economics Teacher" made the transition to Glenbrook North to Midtown High School in the late '90s. Sometimes, comic book cameos aren't reserved for homages to pop culture or other superheroes—in fact, in one case, two very lucky kids wound up alongside his favorite heroes. After entering a Macy's raffle in the late '80s, two readers who won the chance to have their names and likenesses immortalized in the pages of Amazing Spider-Man #313. 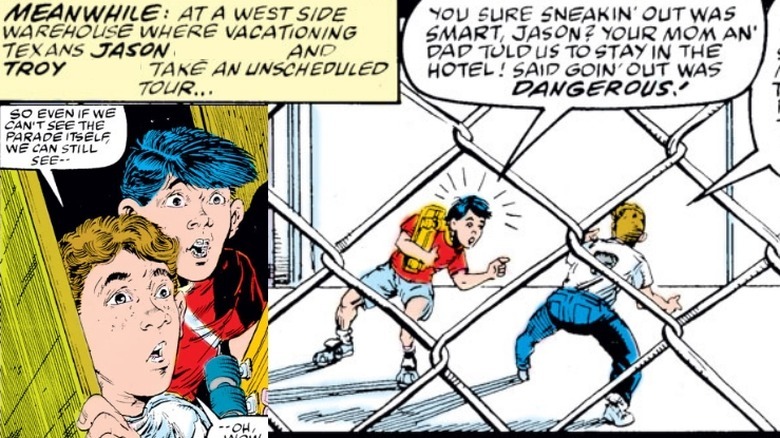 Drawn by now-legendary creator Todd McFarlane, the issue features a few pages in which the boys are assaulted by a demonically possessed parade float (before the wall-crawler saves the day). In addition to this brush with four-color fame, the winners got to bring home a gross (144 copies) of the issue, which later exploded in value, thanks to McFarlane's status as a rising star in sequential art. Thanks to the cameo and the price spike, one winner claims he became a minor celebrity on the comic convention circuit and would strut in and sell off a few books for some mad money. Mad Magazine has lampooned politics, sent up self-aggrandizing movie plots, and flayed TV flubs for decades, paving the way for later mags like National Lampoon, satirists like Mel Brooks and the Wayans Brothers, and sadly, cinematic tripe like Scary Movie 5 and The Starving Games. The magazine's famous mascot, Alfred E. Newman, and his catchphrase "what – me worry?," graced nearly every issue. For a time, Mad connoisseurs seemed to be everywhere and as a result, Newman popped up in some surprising places. Writer David Michelinie and Todd McFarlane were clearly readers, because the redheaded caricature made a blink-and-you'll-miss-it appearance in Amazing Spider-Man #300. 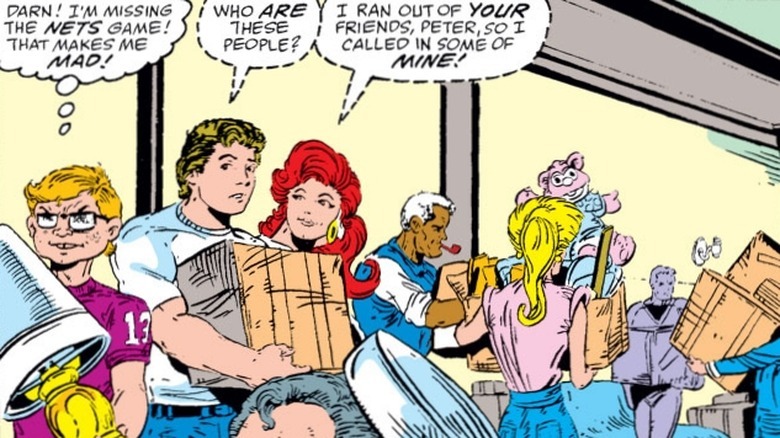 At the deep end of desperation, Spidey's then-wife Mary Jane Watson rang up a few pals to help them move. One of the comic couple's cohorts included a dead ringer for Alfred. He's even "mad" about missing the New Jersey Nets game. Zing! Butch and Sundance or Rick and Morty? While world-renowned for his quick wit, Peter Parker isn't the only Spider-Man in the meta-reference game. In the late 2000s, Spider-Man's alternate universe counterpart was killed by the Green Goblin. 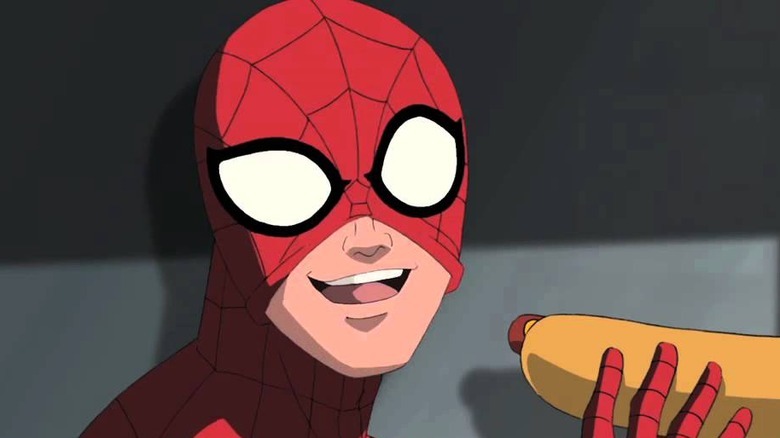 Far from ending the Spider-run, writer Brian Michael Bendis brought in a brand new wall-crawler, and the similarly radioactive-spider-bitten Miles Morales became the new Ultimate Spider-Man. Like his predecessor, Miles is no slouch when it comes to cultural allusions. In a 2017 crossover, he teamed with Spider-Gwen—who's from yet another alternative universe where Gwen Stacy, rather than Peter or Miles, was bitten by a radioactive spider (ah, the Spider-Verse). In Spider-Gwen #18, he also teams up with his father Jefferson Davis, who's moonlighting as an agent of S.H.I.E.L.D. Before they head back to their home dimension, Jefferson insists that they take out a villainous alternative version of himself. 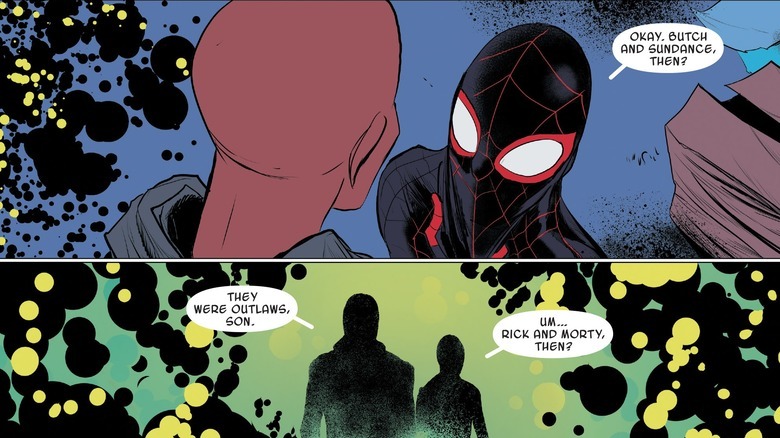 In a fun moment of generational naivety, Miles equates their father-son team up to "Butch Cassidy and the Sundance Kid." Dad demurs, noting that "they were outlaws, son." Caught outside his realm of pop-cultural understanding, Miles quickly alludes to an updated reference, comparing them instead to Rick and Morty. While the exchange is amusing, sweet, and super-meta, comparing dear old dad to amoral alcoholic Rick Sanchez doesn't sound like high praise. Ghostbusters made a mint during its 1984 theatrical run, and as a result, toys, comics, and even spinoff cartoons inundated the '80s and '90s with scads of tie-ins to our favorite team of paranormal investigators and eliminators. The pages of Spider-Man aren't total strangers to the 'busters, either—what with almost being neighbors and all. In Amazing Spider-Man #589, the web-slinger faces off against the Spot. On top of that, Aunt May's charitable organization gets hassled by the Russian mafia. Boy, the Parkers just can't catch a break. In the background of the 2009 issue, the anti-spectral squad is seen in the background. It seems artist Paulo Siqueria ain't afraid of no pop culture references. Even if you're not convinced that the cartoon likenesses of Ray Stanz, Peter Venkman, and Winston Zeddemore (your honor) are really Ghostbusters, Egon's very un-Harold Ramis-like curly blond coiffure is a dead giveaway. The competition between Marvel and DC has always been fierce, or at least that's the impression you'd get from the arguments between seething super-fans. In truth, the "Big Two" comic book competitors often share creative talent and—accidentally or not-so-accidentally—ideas. On rare occasions, the companies have even crossed over, such as the 1996 foray into mutualism known as Amalgam Comics. The comic blend mixed up both universes, merging popular DC heroes with Marvel mainstays such as Batman and Wolverine, who operated as the Dark Claw. With all their shared history, it's unsurprising to find inter-company referential material, in-jokes, and even jabs between the panels. Written and drawn by Brian Michael Bendis and Mark Bagley, Ultimate Spider-Man #1 is already loaded with pop culture asides. 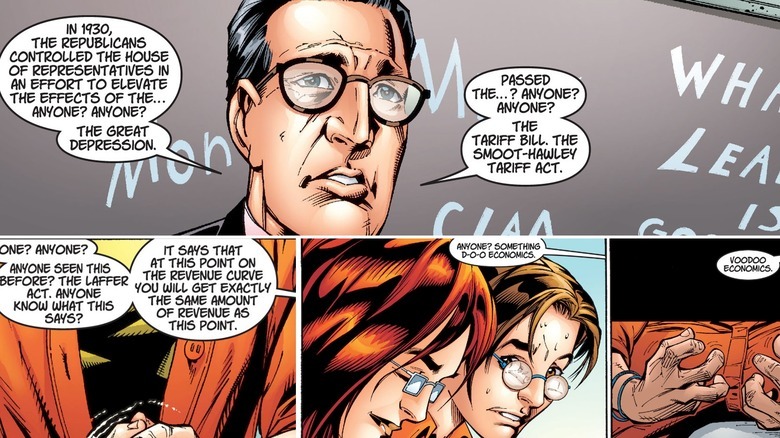 However, Bagley is responsible for one Easter egg that actually portends his future work. 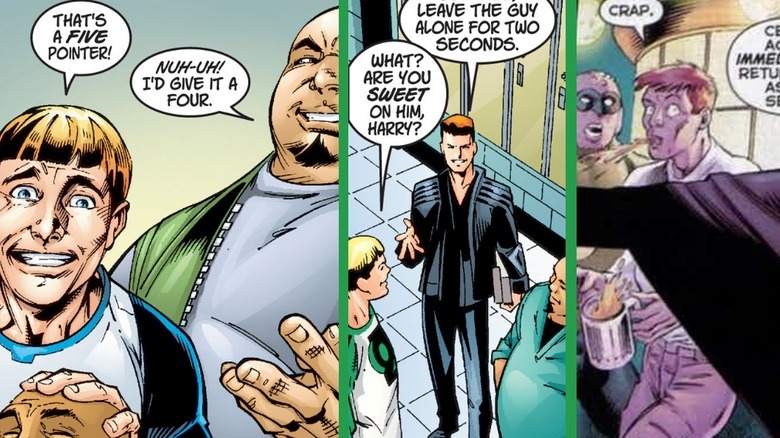 In the book, Peter's high school bully, Flash Thompson, bears a striking resemblance to Bagley's later rendition of Green Lantern corpsman Guy Gardner. Seeing as Spidey's Ultimate version arrived in 2000, and Bagley didn't start working for DC until 2008, his Lantern is almost an homage to his version of Thompson—or perhaps the similarities are just a pleasurable coincidence. At the same time, when you consider that Flash dons a Green Lantern t-shirt later in the issue, perhaps Bagley's work wasn't just happy happenstance. No matter how you slice it, we've definitely got an emerald Easter Egg.